That's where enterprise performance management (EPM) software comes in. By replacing spreadsheets or proprietary applications used to support complex financial management processes, EPM solutions can take your ERP system to a whole new level. When it comes to addressing market and customer demands, you can’t afford to let your valuable data assets become trapped in your ERP system, especially if you’re running an aging or legacy system. Your business applications must be able to support changes quickly, so you can keep pace with your competitors, exceed customer expectations, and ensure your continuous operations are free of service disruptions. Infor d/EPM can help you achieve these goals. With Infor d/EPM, you can access latent data for value-added analysis. Here’s how it works: In addition to handling operational reporting on transactional data, ERP systems support basic financial and management reporting, including top-level financial statements, such as the balance sheet, income statement, and statement of cash flows, as well as back office transaction processing and operational process support. This data is typically summarized in the general ledger (GL). Despite the breadth of their reach, most ERP systems fall short when it comes to supporting more complex financial processes. That’s where Infor d/EPM comes in, because it is designed to collect and consolidate financial results from single or multiple GLs, and other data sources. Consolidate and report financial results from multiple ERP/GL systems. Iteratively collect, compile, and manage financial and operational budgets. Manage a rolling forecast process. Perform “what-if” scenario modeling of different financial or operational scenarios. 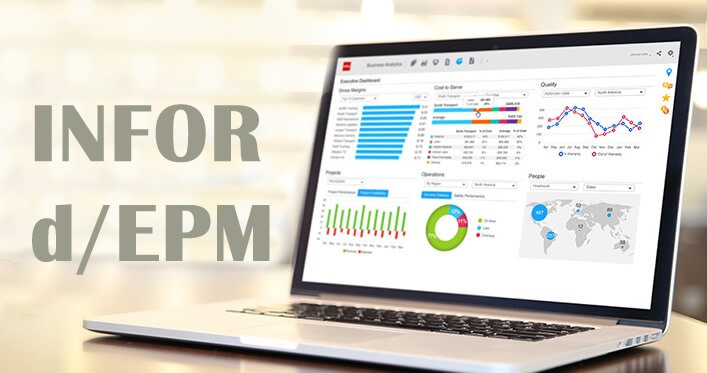 Infor d/EPM gives you the additional functionality you need to analyse ERP system data about your performance and model the operational and financial impacts of decisions before you act. You can’t do that with an ERP system alone. Whether you’re running your ERP system on-premises, in the cloud, or both, you can easily integrate your Infor and non-Infor ERP system with Infor d/EPM. This seamless integration reduces the strain on your IT departments by making it easier to securely manage your technology investments, stay up to date with upgrades, and limit hardware-related expenses. Because Infor d/EPM is designed to collect and consolidate financial results from single or multiple general ledgers, and other data sources, you get built-in support for complexities such as currency translation, intercompany eliminations, and reporting under multiple accounting guidelines, such as US GAAP or IFRS. 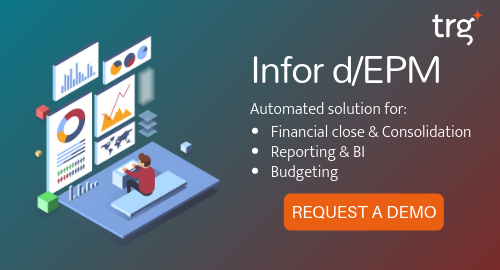 Infor d/EPM also provides flexible, self-service reporting tools that allow finance users to easily create and produce a wide variety of financial and management reports, with no IT support. You can automate and accelerate the period-end close and reporting process—and spend more time on value-added analysis.